When Should Your Baby Learn to Walk? Did you encourage your baby to walk by holding his/her hands and letting him practice stepping …I know I did this. However, I did not make a game of it nor did I do it over and over as a practice or encouragement to walk. As I recall, we just let our little one learn to crawl, pull up on things to a standing position and then to fall on his bottom and try it all over again and again by himself. I do believe babies are self-learners and will learn to crawl, stand and walk when they are “ready”…all in good time. I also believe that most parents who practice walking with their little ones do so, not because they want to hurry their baby along…they do it, just to give their baby a chance to step and step and see what it is like to get somewhere in an upright position…also they are merely having fun with their child. When you baby is beginning to pull up and stand…he just might need some help getting back down again…if he seems to want help, show him how to bed his knees and sit down again…rather than letting him fall. An easier way than holding on to your baby’s arms to help him walk is to encourage him by holding out your hands so that he is encouraged to walk towards you. Some baby’s like push and pull toys when first starting to walk. Baby walkers are not encouraged by the American Academy of Pediatrics…they can actually prevent your child’s muscle from developing properly because they make it so easy for baby to scoot around. Barefeet are also a good way to encourage baby balance and coordination. You will need to childproof baby’s environment when he is learning to walk so that he does not fall on hard surfaces or reach harmful items. Although, I love RIE principles and enjoy Janet Lansbury’s perspective, I think there is basically only one reason not to walk babies and that is the one that appears below. However, if you choose to help your baby to practice stepping…don’t berate yourself nor carry around guilt for doing so. 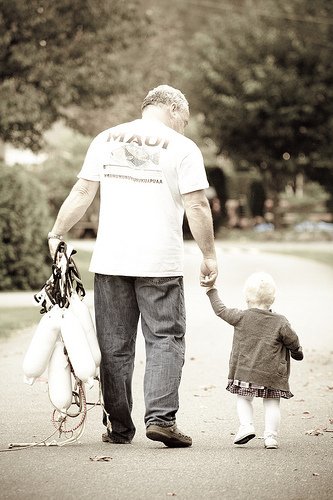 Simply work on your patience and enjoy your little one…and one day ah ha….he will be walking and you will be chasing after him or you will be holding hands taking a walk together like the grandpa here. “Only a baby knows just the way his joints should align,” notes Carol Pinto, a longtime RIE Associate, Feldenkrais practitioner and friend. In other words, when it comes to motor development, babies are self-learners — they really do know best. By holding a baby’s hands to mobilize him, position and reposition his body, we hinder his natural ability to find balance, sense spatial relations, and judge what he can and cannot do. 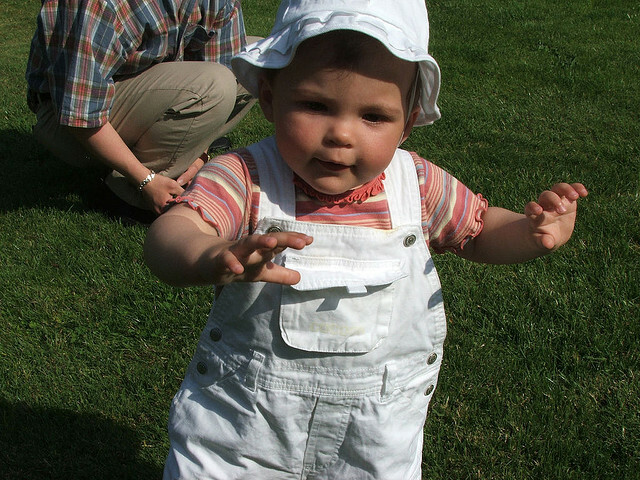 Better to trust our babies to walk when they are ready, and by doing so encourage mental and physical awareness. 9 Reasons Not To Walk Babies | Janet Lansbury. Developmental milestone: Walking | BabyCenter. This entry was posted in Ages and Stages, Kids, Parenting by llpitlwp. Bookmark the permalink.